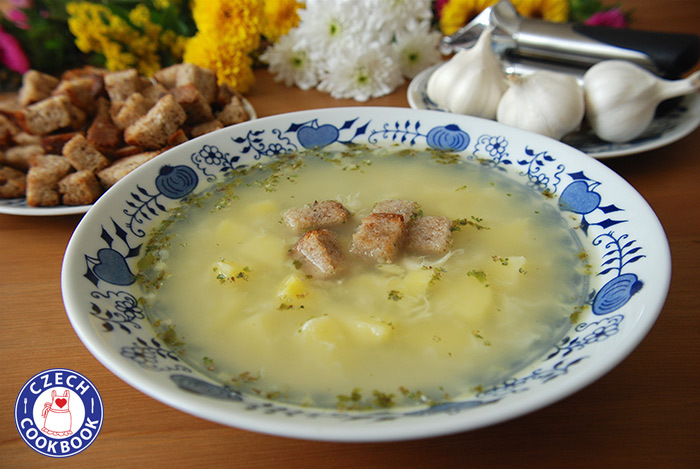 I just watched your video for the garlic soup and it looks delicious! It’s so good to have you back & so happy you’re better. I have to say I love your husband’s shirt in the video! Just watched your garlic soup video. WOW! Can’t wait to make it. I have been searching for a recipe close to the garlic soup I remember from cesky krumlov. All other recipes are for a creamy soup, but you nailed it! It’s so good I could eat a pot a day! Thank you!! My toddlers watched your video too and were excited to help me make this simple soup. They loved it too! I really want to make this soup but I’m allergic to potatoes 🙁 Any suggestions for a substitute? Do you think parsnips would work? You could just skip the potatoes and add more bread and cheese. Parsnip would probably work too even though it is less authentic. Hello Kristyna.I just wach your video and I love your web – side.I leave in Australia.Thank you very much for your recipes. Tak to me tesi. 🙂 Dekuji za krasna slova! Hi hi, tak to je parada! 🙂 Pochvaly si moc vazim! Since the garlic is cooked it is not strong and should not give you bad breath. Dnes jsem uvarila tuto polivecku podle vaseho receptu-videa. Dokonce i moje 4-leta dcera ji snedla a chutnala ji. Ja nerada varim komplikovana ceska jidla, ale podle vasich receptu se moc dobre vari. Mate dobry vyklad a vse se zda tak jednoduche, ze clovek ma hned chut si to taky uvarit 🙂 Dekujeme moc za vasi stranku a recepty, musite s tim mit spoustu prace, ale je videt, ze vas to moc bavi. My bydlime v Toronte v Kanade, ale ja jsem taky z Brna 😉 Ahoj, Andrea. Ahoj Andrejko, moc zdravim dalsi Brnacku. 🙂 A spoustu pozdravu do Toronta. Jsem rada, ze polivecka chutnala a ze recepty libi. 🙂 Ano je s tim hodne prace, ale mam radost, kdyz se recept podari a lidem chutna. To me pak moc tesi. What is that bottle that looks like soy sauce? You said your dad likes to add a bit. It is Maggi brand called Seasoning. Thanks. Made this last night and it was delicious. Tempering the egg with some soup before adding it to the pot gives the soup a velvety texture. My husband and I made this last night. We boiled some chicken thighs for broth and decided to throw the chicken meat in with the potatoes. It was so good. I am certain it will be good with water, but you might try it with chicken. Great recipe! Making it for second time – one of my faves! Glad you enjoyed it Linda! Yes it is perfect for this type of weather.